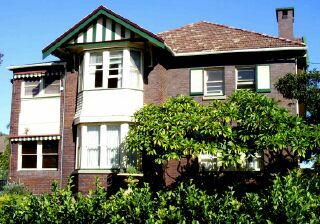 ‘Dalmeny’ was located at 18 Wakeford Road Strathfield. The house has been demolished and the site redeveloped. ‘Dalmeny’ was a two storey interwar bungalow style house. It featured a hipped and gabled terracotta tiled roof, with the imitation half-timbered gable end above a two storey bay featuring faceted bay windows at both levels, the upper having a timber-shingled apron. Windows are timber-framed double-hung, one upper pair featuring timber shutters. The house also features an enclosed two storey verandah with timber shingling. There is a single brick chimney with square openings at the top and a flat cement cap. The house was built in 1924 by builders Loveridge and Hudson for the owner Colin Hudson (d.1974). Hudson was a partner in Loveridge and Hudson and also served as an Alderman (1941-1952) & Mayor (1944-1949) of Strathfield Council. Hudson Park Strathfield is named after him.